Hervé Noury has released Six Toungs Tone Palette and Monophone, two freeware VST plug-ins for Windows PC. 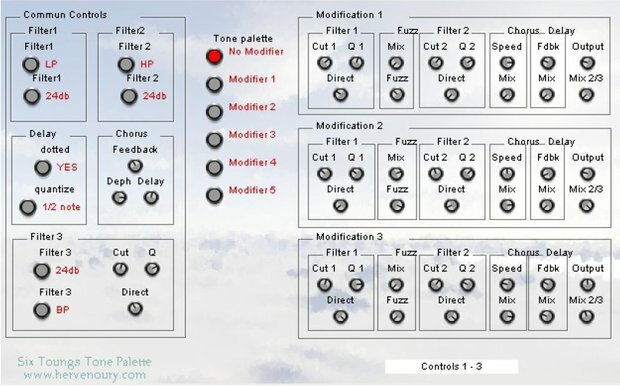 Six Toungs Tone Palette is a VST effect that allow you to create several modulations of an audio source’s timbre, and select them during the performance via a selector, like a painter selects his colours on his palette. Monophone is not a synthesizer : it is a Pierre Henry like experimental music studio presented as a VST instrument. Several wave players replace old tape recorders. These sources can modulate one each other via envelope followers, pitch detectors and a vocoder also. You can download these and more freeware plug-ins from Hervé Noury’s Musical Shop (scroll down and click on “Instrument VST” image to access the free downloads). Visit Hervé Noury for more information.